Portland is the largest city in the U.S. state of Maine and the county seat of Cumberland County. In 2013, the city proper had a population of 66,318, growing 3 percent since the census of 2000, while the urban area had a population of 203,914. The Greater Portland metropolitan area is home to over half a million people, more than one-third of Maine's total population. Deering Oaks Park with fountain and castle pavilion is located at the point where Interstate 295 meets State Street, Park Avenue, and Deering Avenue. Native Americans originally called the Portland peninsula Machigonne. The first European settler was Capt. Christopher Levett, an English naval captain granted 6,000 acres (2,400 ha) by King Charles I of England in 1623 to found a settlement in Casco Bay. A member of the Council for New England and agent for Ferdinando Gorges, Levett built a stone house where he left a company of ten men, then returned to England and wrote a book about his voyage to drum up support for the settlement. The settlement failed, and the fate of Levett's colonists is unknown. The explorer sailed from England to the Massachusetts Bay Colony to meet John Winthrop in 1630, but never returned to Maine. Fort Levett in the harbor is named for him. The peninsula was first permanently settled in 1633 as a fishing and trading village named Casco. When the Massachusetts Bay Colony took over Casco Bay in 1658, the town's name changed again to Falmouth. In 1676, the village was destroyed by the Wampanoag during King Philip's War. It was rebuilt. During King William's War, a raiding party of French and Native allies attacked and largely destroyed it again in the Battle of Fort Loyal (1690). 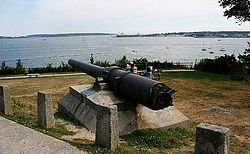 On October 18, 1775, Falmouth was burned in the Revolution by the Royal Navy under command of Captain Henry Mowat. Following the war, a section of Falmouth called The Neck developed as a commercial port and began to grow rapidly as a shipping center. In 1786, the citizens of Falmouth formed a separate town in Falmouth Neck and named it Portland, after the isle off the coast of Dorset, England. Portland's economy was greatly stressed by the Embargo Act of 1807 (prohibition of trade with the British), which ended in 1809, and the War of 1812, which ended in 1815. In 1820, Maine became a state with Portland as its capital. In 1832, the capital was moved north to Augusta. In 1851, Maine led the nation by passing the first state law prohibiting the sale of alcohol except for "medicinal, mechanical or manufacturing purposes." The law subsequently became known as the Maine law, as 18 states quickly followed. On June 2, 1855, the Portland Rum Riot occurred. On June 26, 1863, a Confederate raiding party led by Captain Charles Read, entered the harbor at Portland and the Battle of Portland Harbor ensued, one of the northernmost battles of the Civil War. The 1866 Great Fire of Portland, Maine of July 4, 1866, ignited during the Independence Day celebration, destroyed most of the commercial buildings in the city, half the churches and hundreds of homes. More than 10,000 people were left homeless. In 1853, upon completion of the Grand Trunk Railway to Montreal, Portland became the primary ice-free winter seaport for Canadian exports. The Portland Company manufactured more than 600 19th-century steam locomotives. Portland became a 20th-century rail hub as five additional rail lines merged into Portland Terminal Company in 1911. Following nationalization of the Grand Trunk system in 1923, Canadian export traffic was diverted from Portland to Halifax, Nova Scotia, causing marked local economic decline. In the 20th century, icebreakers later enabled ships to reach Montreal in winter, drastically reducing Portland's role as a winter port for Canada. The erection of The Maine Mall, an indoor shopping center established in the suburb of South Portland during the 1970s, economically depressed downtown Portland. 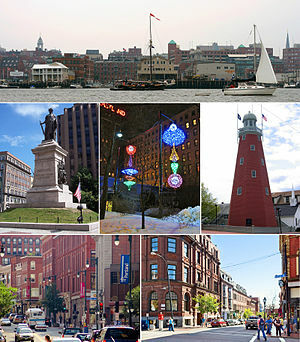 The trend reversed when tourists and new businesses started revitalizing the old seaport, locally known as the Old Port. Since the 1990s the historically industrial Bayside neighborhood saw rapid development. The emerging harborside Ocean Gateway neighborhood at the base of Munjoy Hill. The Maine College of Art has been a revitalizing force downtown, attracting students from around the country. The historic Porteous building on Congress Street was restored by the College. According to the United States Census Bureau, the city has a total area of 69.44 square miles (179.85 km2), of which, 21.31 square miles (55.19 km2) is land and 48.13 square miles (124.66 km2) is water. Portland is on a peninsula in Casco Bay on the Gulf of Maine and the Atlantic Ocean. Portland has a humid continental climate (Köppen: Dfb), with cold snowy winters, and warm summers. The monthly daily average temperature ranges from 22.3 °F (−5.4 °C) in January to 69.1 °F (20.6 °C) in July. The high exceeds 90 °F (32 °C) on 4.6 days per year, while lows of 0 °F (−18 °C) or below are reached on 7.7 nights annually. The area can be affected by severe nor'easters during winter, with high winds and snowfall totals. Precipitation averages 47.2 inches (1,200 mm) and is plentiful year-round, but with a slightly drier summer; snowfall averages 64 inches (163 cm). Direct strikes by hurricanes or tropical storms are rare, partially due to the normally cooler Atlantic waters off the Maine coast, but primarily because of the curvature of the southern Maine coast in relation to the typical path of tropical systems north of 40 degrees North latitude. Extremes range from −39 °F (−39 °C) on February 16, 1943 to 103 °F (39 °C) on July 4, 1911 and August 2, 1975. Portland is organized into neighborhoods generally recognized by residents, but they have no legal or political authority. In many cases, city signs identify neighborhoods or intersections (which are often called corners). Most city neighborhoods have a local association, which usually maintains on-going relations of varying degrees with the city government on issues affecting the neighborhood. On March 8, 1899, Portland annexed the neighboring city of Deering. Deering neighborhoods now comprise the northern and eastern sections of the city before the merger. Portland's Deering High School was formerly the public high school for Deering. Portland's neighborhoods include the Arts District, Bayside, Bradley's Corner, Cushing's Island, Deering Center, Deering Highlands, Downtown, East Deering, East Bayside, East End, Eastern Cemetery, Great Diamond Island, Highlands, Kennedy Park, Libbytown, Little Diamond Island, Lunt's Corner, Morrill's Corner, Munjoy Hill, Nason's Corner, North Deering, Oakdale, the Old Port, Parkside, Peaks Island, Riverton Park, Rosemont, Stroudwater, the West End, and Woodford's Corner. According to the 2010 American Census Bureau Estimates, the city's population was 85.0% White (83.6% non-Hispanic White alone), down from 96.6% in 1990, 4.1% Black or African American, 0.9% American Indian and Alaska Native, 3.5% Asian, 1.6% from some other race and 2.7% from two or more races. 6.0% of the total population was Hispanic or Latino of any race. 40.7% of the population had a Bachelor's degree or higher. Men's Health ranked Portland the ninth most educated city in America. As of the census of 2010, there were 66,194 people, 30,725 households, and 13,324 families residing in the city. The population density was 3,106.2 inhabitants per square mile (1,199.3 /km2). There were 33,836 housing units at an average density of 1,587.8 per square mile (613.1 /km2). The racial makeup of the city was 85.0% White, 4.1% African American, 0.5% Native American, 3.5% Asian, 1.2% from other races, and 2.7% from two or more races. Hispanic or Latino of any race were 6.0% of the population. According to the U.S. Census Bureau, Portland's immediate metropolitan area ranked 147th in the nation in 2000 with a population of 243,537, while the Portland/South Portland/Biddeford metropolitan area included 487,568 total inhabitants. This has increased to an estimated 513,102 inhabitants as of 2007. Much of this increase in population has been due to growth in the city's southern and western suburbs. The racial makeup of the city was 91.27% White,2.59% African American, 0.47% Native American, 3.08% Asian, 0.06% Pacific Islander, 0.67% from other races, and 1.86% from two or more races. Hispanic or Latino of any race were 1.52% of the population. The largest ancestries include: English (21.2%), Irish (19.2%), French (10.8%), German (10.5%), and Italian (6.9%). In the city the population was spread out with 18.8% under the age of 18, 10.7% from 18 to 24, 36.1% from 25 to 44, 20.6% from 45 to 64, and 13.9% who were 65 years of age or older. The median age was 36 years. For every 100 females there were 91.8 males. For every 100 females age 18 and over, there were 89.0 males. Portland has a low unemployment level when compared to national and state averages, 6.8% in January 2011. Portland and surrounding communities also have higher median incomes than most other Maine communities. The Portland-Montreal Pipe Line, a crude oil pipeline that stretches from South Portland to Montreal, was a major contributing factor in these rankings. Portland is home to increased urban farming, particularly in the East Bayside neighborhood. The Arts District, centered on Congress Street, is home to the Portland Museum of Art, Portland Stage Company, Maine Historical Society & Museum, Maine College of Art, Children's Museum of Maine, SPACE Gallery, Merrill Auditorium, the Kotzschmar Memorial Organ, and Portland Symphony Orchestra, as well as many smaller art galleries and studios. Baxter Boulevard around Back Cove, Deering Oaks Park, the Eastern Promenade, Western Promenade, Lincoln Park and Riverton Park are all historical parks within the city. Other parks and natural spaces include Payson Park, Post Office Park, Baxter Woods, Evergreen Cemetery, Western Cemetery and the Fore River Sanctuary. The non-profit organization Portland Trails maintains an extensive network of walking and hiking trails throughout the city and neighboring communities. A more recent building of note is Franklin Towers, a 17-story residential tower completed in 1969. At 204 feet (62.2 meters), it is Portland's (as well as Maine's) tallest building. It is next to the Cathedral of the Immaculate Conception on the city skyline. During the building boom of the 1980s, several new buildings rose on the peninsula, including the 1983 Charles Shipman Payson Building by Henry N. Cobb of Pei, Cobb, Freed & Partners at the Portland Museum of Art complex (a component of which is the 1801 McLellan-Sweat Mansion), and the Back Bay Tower, a 15-story residential building completed in 1990. 477 Congress Street (known locally as the Time and Temperature Building) is situated near Monument Square in the Arts District and is a major landmark: the 14-story building features a large electronic sign on its roof that flashes time and temperature data, as well as parking ban information in the winter. The sign can be seen from nearly all of downtown Portland. The building is home to several radio stations. It is also currently home to the studio of ABC affiliate WMTW-TV 8, though they have announced their intention to vacate the building and move to a facility in Westbrook by October 2014. The Eastland Park Hotel, completed in 1927, is a prominent hotel located on High St. in downtown Portland. Photographer Todd Webb lived in Portland during his later years and took many pictures of the city. Some of Webb's pictures of Portland can be found at the Evans Gallery in South Portland. WCSH is the city's NBC affiliate, located in the Arts District. Portland is home to a concentration of publishing and broadcast companies, advertising agencies, web designers, commercial photography studios and film makers. The city is home to two daily newspapers, The Portland Press Herald/Maine Sunday Telegram founded in 1862 and The Portland Daily Sun. The Press Herald is published Monday through Saturday, and The Maine Sunday Telegram, is published on Sundays. Both are published by MaineToday Media, Inc., which also operates an entertainment website, MaineToday.com and owns papers in Augusta, Waterville and Bath. The Daily Sun began operation in 2009; it is owned and published by the The Conway Daily Sun in North Conway, New Hampshire. Portland is also covered by an alternative weekly newspaper, The Portland Phoenix, published by the Phoenix Media/Communications Group, which also produces a New England-wide news, arts, and entertainment website, thephoenix.com, and a twice-annual GLBT issues magazine, Out In Maine. The Portland broadcast media market is the largest one in Maine in both radio and television. A whole host of radio options are available in Portland, including WFNK (Classic Hits), WJJB (Sports), WTHT (Country), WBQW (Classical), WHXR (Rock), WHOM (Adult Contemporary), WJBQ (Top 40), WCLZ (Adult Album Alternative), WBLM (Classic Rock), WYNZ ('60s-'70s Hits), and WCYY (Modern rock). WMPG is a local non-commercial radio station, run by community members and the University of Southern Maine. The Maine Public Broadcasting Network's (MPBN) radio news operations are based in Portland. The area is served by local television stations representing most of the television networks. These stations include WCSH 6 (NBC), WMTW 8 (ABC), WGME 13 (CBS), WPFO 23 (Fox), WPME 35 (MyNetworkTV), and WPXT 51 (The CW). There is no PBS affiliate licensed to the city of Portland but the market is served by MPBN outlets WCBB Channel 10 in Augusta and WMEA-TV Channel 26 Biddeford. Entrance area of Hadlock Field, home of the Portland Sea Dogs. The city is home to three minor-league teams. The AA Portland Sea Dogs; a farm team of the Boston Red Sox play at Hadlock Field, American Hockey League team Portland Pirates play at the Cross Insurance Arena and the Maine Red Claws play at the Portland Exposition Building. The Red Claws are part of the NBA Development League, and are affiliated with the Boston Celtics of the NBA. It was announced on December 2, 2013 that Portland would be home to the United States Lacrosse League team the Maine Moose Trax, who will play at the Cross Insurance Arena. A few of the many restaurants in Portland, Maine. The downtown area of Portland, including the Arts District and the Old Port have a high concentration of eating and drinking establishments, with many more to be found throughout the rest of the peninsula, outlying neighborhoods, and neighboring communities. Local lore holds that Portland ranks among the top U.S. cities in restaurants and bars per capita. According to the Maine Restaurant Association, Portland is currently home to about 230 restaurants. Many of these institutions cater to niche markets in the culinary world, perhaps most notably the harvest of local sea cucumbers that are primarily exported to Asian markets. Portland has developed a national reputation for the quality of its restaurants and eateries. In 2009, Portland was named the "Foodiest Small Town in America" by Bon Appétit magazine, and was featured in the New York Times as a food destination. In the spring of 2007, Portland was nominated as one of three finalists for "Delicious Destination of the Year" at the 2007 Food Network Awards. Many local chefs have gained national attention over the past few years. The city and outlying region played host to Rachael Ray in an episode of her Food Network Series $40 a Day, and was also featured in the Travel Channel series Man v. Food and Anthony Bourdain: No Reservations in 2010. Portland is home to a number of microbreweries and brewpubs, including the D. L. Geary Brewing Company, Gritty McDuff's Brewing Company, Shipyard Brewing Company, Casco Bay Brewing Co., and Allagash Brewing Company. Portland is the birthplace of the "Italian sandwich". Southern Maine's signature sandwich, it is called simply "an Italian" by locals. Italian sandwiches are available at many stores, but most famously at Amato's Italian delicatessens, which claims to have originated the sandwich (hence the name). The Portland Farmers' Market, which has been in continuous operation since 1768, takes place every Monday and Wednesday in Monument Square and every Saturday in Deering Oaks Park during the warm months and every Saturday indoors during the winter. Fresh fish and seafood can be purchased at a number of markets on the wharves along Commercial Street, and numerous artisan bread makers bake fresh loaves every day. Appreciation for sustainable food and farming gained a significant boost throughout the state in the 1970s when back-to-the-landers moved to Maine in droves. With them came the resurgence of farmers' markets (including the expansion of the Portland market), a significant organic farming movement and an increased interest in plant-based cuisine. The echoes of this movement continue in Portland, where restaurants emphasize local and organic food and where the state's greatest concentration of vegetarian and vegetarian-friendly restaurants can be found. The city has adopted a council-manager style government that is detailed in the city charter. The citizens of Portland are represented by a nine member city council which makes policy, passes ordinances, approves appropriations, appoints the city manager and oversees the municipal government. The city council of nine members is elected by the citizens of Portland. The city has five voting districts, with each district electing a city councilor to represent their neighborhood interests for a three-year term. There are also four members of the city council who are elected at-large. From 1923 until 2011, city councilors chose one of themselves each year to serve as mayor, a primarily ceremonial position. On November 2, 2010, Portland voters narrowly approved a measure that allowed them to elect the mayor. On November 8, 2011, former State Senator and candidate for U.S. Congress Michael F. Brennan was elected as mayor. On December 5, 2011, he was sworn in as the first citizen-elected mayor in 88 years (see Portland, Maine mayoral election, 2011). The office of mayor is a four-year paid position. A city manager is appointed by the city council. The city manager oversees the daily operations of the city government, appoints the heads of city departments, and prepares annual budgets. The city manager directs all city agencies and departments, and is responsible for the executing laws and policies passed by the city council. The current city manager is Mark Rees. Aside from the main city council there is also an elected school board for the Portland Public School system. The school board is made up in the same manner of the city council with five district members, four at-large members and one chairman. There are also three students from the local high schools elected to serve on the board. There are many other boards and committees such as the Planning Committee, Board of Appeals, and Harbor Commission, etc. These committees and boards have limited power in their respective areas of expertise. Members of boards and committees are appointed by city council members. On November 5, 2013, Portland voters overwhelmingly approved an ordinance to legalize the possession and private use of marijuana for adults, making the city the first municipality in the Eastern United States to do so. The Portland Fire Department (PFD) provides fire protection and emergency medical services to the city of Portland 24/7, 365. Established in 1768, the PFD is made up of over 230 paid, professional firefighters and operates out of 7 Fire Stations, located throughout the city, in addition to Fire Stations staffed by "on-call" firefighters on Peaks Island, Great Diamond Island, Cushing Island, and Cliff Island. The Portland Fire Department also operates an Airport Division Station at 1001 Westbrook St., at the Portland International Jetport, and a Marine Division Station, located at 54 Commercial St. The Portland Fire Department also operates a fire apparatus fleet of 4 Engine Companies (5 when manpower permits), 4 Ladder Companies (including 2 Quints), 1 Rescue Company, 1 Hazardous Materials (Haz-Mat.) Unit, 1 Confined-Space Rescue Unit, 5 ARFF Crash Rescue Units, 3 Marine Units (Fireboats), 5 MEDCU Units (Ambulances), and numerous other special, support, and reserve units. Island "call" firefighters man a total of 4 Engines, 1 Ladder, 4 Water Tank Units, and 3 MEDCU Units (Ambulances). Each frontline fire company is staffed by 1 Officer and 2 Firefighters per shift. Each MEDCU Unit (Ambulance) is staffed by 2 Firefighter/EMT's per shift. The Marine Division is staffed by 1 Officer and 2 Firefighters per shift, who also cross-staff Engine 7 in the event of a structural fire in the city not requiring a Marine Unit. The current Chief of Department is Jerome F. LaMoria. Maine Medical Center a Level One Trauma Center is the largest hospital in Maine and is continuing to expand its campus and services. Mercy Hospital, a faith-based hospital, is the fourth-largest hospital in the state and began construction on its new campus along the Fore River in late 2006. The project is expected to be constructed in several phases, with completion of the first phase scheduled for 2008. The formerly independent Brighton Medical Center (once known as the Osteopathic Hospital) is now owned by Maine Medical Center and is operated as a minor care center under the name Brighton First Care and New England Rehab. In 2010, Maine Medical Center's Hannaford Center for Safety, Innovation and Simulation opened at the Brighton campus. The former Portland General Hospital is now home to the Barron Center nursing facility. Portland is accessible from I-95 (the Maine Turnpike), I-295, and US 1. Also, U.S. Route 302, a major travel route and scenic highway between Maine and Vermont, has its eastern terminus in Portland. State Routes include SR 9, SR 22, SR 25, SR 26, SR 77, and SR 100. SR 25 Business goes through southwestern Portland. Concord Coach Lines bus service connects Portland to 14 other communities in Maine as well as to Boston's South Station and Logan Airport. Amtrak's Downeaster train service connects the city with eight towns and cities to the south, ending at Boston's North Station. To the north, the Downeaster goes to Freeport and Brunswick. Both Concord Coach Lines and the Downeaster can be found at the Portland Transportation Center on Thompsons Point Road, in Portland's Libbytown neighborhood. Greyhound Lines on Saint John Street connects to 17 Maine communities and to more than 3,600 U.S. destinations. A carsharing service provided by Uhaul Car Share is available. The city operates several transportation hubs. 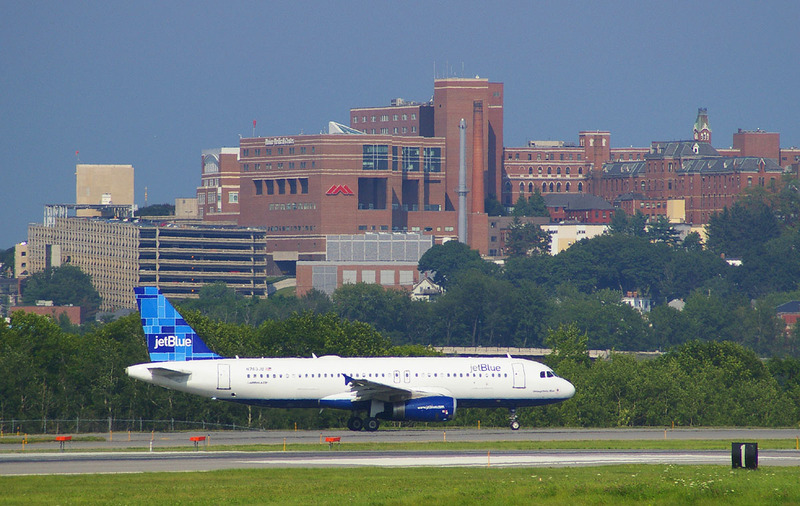 In addition to the transportation center, commercial air service is available at the Portland International Jetport, located in Stroudwater west of the city's downtown district. Several car rental agencies are located at the jetport. The Port of Portland is the second-largest cruise and passenger destination in the state (next to Bar Harbor), and is served by the Ocean Gateway International Marine Passenger Terminal. Ferry service is available year-round to many destinations in Casco Bay. From 2006 to 2009, Bay Ferries operated a high speed ferry called The Cat featuring a five-hour trip to Yarmouth, Nova Scotia for summer passengers and cars. Before that, the Scotia Prince Cruises trip took eleven hours. A proposal to replace the defunct Nova Scotia ferry services was rejected in 2013 by Nova Scotia's government. Starting on May 15, 2014, the cruise ship ferry Nova Star will be making daily trips from Portland to Yarmouth, Nova Scotia until November. There are two public bus systems in Portland. The Portland Explorer is a service that connects various transportation centers within the city and the METRO provides public bus transit throughout Portland and the surrounding area. South Portland's municipal bus service connects with Portland's METRO service. Numerous private taxi cab companies operate in and around Portland. Ranked No. 9 Travel and Leisure magazine's "America's Best Cities for Hipsters” (2013). Ranked as Bon Appétit magazine's "America's Foodiest Small Town" (2009). Ranked No. 1 on Forbes.com "America's Most Livable Cities" (2009). Ranked No. 12 on Frommer's 2007 "Top Travel Destinations". Ranked No. 20 in Inc. Magazine 2006 "Boom Town List of Hottest Cities for Entrepreneurs". Named No. 14 in "Best Performing Cities" index by the Milken Institute, November 2004. Ranked No. 13 on Men's Health Magazine's list of America's 100 most "car crazed" cities. Ranked No. 20 on the list of Top 20 Best Small Cities for College Students by the American Institute for Economic Research. Named one of the "Coolest Small Cities in America" by GQ Magazine. Ranked as the third gayest city in the nation by UCLA's Williams Institute. Named Best Adventure Town in the East by Outside Magazine. Ranked fourth on Sperlings Best Places list for America's Foodie Cities! Ranked No. 3 Parenting Magazine "Best Cities for Families." ^ a b "US Gazetteer files 2010". United States Census Bureau. http://www.census.gov/geo/www/gazetteer/files/Gaz_places_national.txt. Retrieved November 23, 2012. ^ a b "American FactFinder". United States Census Bureau. http://factfinder2.census.gov/faces/nav/jsf/pages/index.xhtml. Retrieved November 23, 2012. ^ a b "State & County QuickFacts". United States Census Bureau. http://quickfacts.census.gov/qfd/states/23/2360545.html. Retrieved July 24, 2014. ^ "Portland: The Town that was Almost Boston". Portland Oregon Visitors Association. http://www.naosmm.org/confer/port-or/history.html. Retrieved March 6, 2013. ^ "Jedediah Preble letter on Mowat kidnapping, 1775". http://www.mainememory.net/bin/Detail?ln=7479. Retrieved April 1, 2007. ^ Coolidge, A.J. and J.B. Mansfeld. 1859. A History and Description of New England, General and Local. Boston: Austin J. Coolidge, p. 301. ^ "Bayside is a journey of many 'next steps'". Portland Press Herald (Blethen Maine Newspapers, Inc.). October 16, 2006. http://business.mainetoday.com/news/061016bayside.html. Retrieved November 13, 2006. ^ Bouchard, Kelley (October 6, 2006). "Riverwalk: Parking garage due to rise; luxury condos to follow". Portland Press Herald (Blethen Maine Newspapers, Inc.). http://pressherald.mainetoday.com/news/local/061006riverwalk.html. Retrieved November 13, 2006. ^ Turkel, Tux (February 6, 2007). "An urban vision rises in Bayside". Portland Press Herald (Blethen Maine Newspapers, Inc.). http://business.mainetoday.com/news/070206bayside.html. Retrieved February 27, 2007. ^ "Shall We Tax the Hunters?". Lewiston Evening Journal (Google News Archive): p. 2. February 2, 1899. http://news.google.com/newspapers?id=ZMIgAAAAIBAJ&sjid=fmoFAAAAIBAJ&pg=926,2137056&dq=portland+deering&hl=en. ^ a b Deans, Emma (July 8, 2010). "Welcome to Nowhere | Reconnecting an amputated neighborhood". The Bollard. http://www.thebollard.com/bollard/?p=7612. Retrieved July 12, 2010. ^ United States Census Bureau. "Census of Population and Housing". http://www.census.gov/prod/www/decennial.html. Retrieved September 18, 2013. ^ "Minor Civil Division Population Search Results". University of Maine. http://www.library.umaine.edu/census/townsearch.asp. Retrieved September 18, 2013. ^ "Annual Estimates of the Resident Population: April 1, 2010 to July 1, 2012". http://www.census.gov/popest/data/cities/totals/2012/SUB-EST2012-3.html. Retrieved September 18, 2013. ^ "Maine - Race and Hispanic Origin for Selected Cities and Other Places: Earliest Census to 1990". U.S. Census Bureau. http://www.census.gov/population/www/documentation/twps0076/twps0076.html. ^ "Table 1. Annual Estimates of the Population of Metropolitan and Micropolitan Statistical Areas: April 1, 2010 to July 1, 2012 (CBSA-EST2012-01)" (CSV). 2012 Population Estimates. United States Census Bureau, Population Division. September 18, 2013. http://www.census.gov/popest/data/metro/totals/2012/tables/CBSA-EST2012-01.csv. Retrieved September 18, 2013. ^ "Portland, Maine". City Data. 2010. http://www.city-data.com/city/Portland-Maine.html. Retrieved April 3, 2010. ^ CB Richard Ellis/The Boulos Company. "Greater Portland Area 2006 Office Market Survey" (PDF). http://www.cbre.com/NR/rdonlyres/3CB731EA-C269-11D5-A91D-00508B5B0FEB/328757/PortlandMarketSurvey2006.pdf. Retrieved August 10, 2006. ^ J. Craig Anderson (April 18, 2014). "WMTW moving to Westbrook studio occupied by WPME, WPXT". http://www.pressherald.com/business/WMTW_moving_to_studio_occupied_by_WPME__WPXT_.html?searchterm=Time+and+Temperature+Building. Retrieved June 1, 2014. ^ Bob Keyes (April 4, 2010). "THAT '70S SHOW: A new photography exhibition offers a look back at a very different Portland". Maine Sunday Telegram. http://www.pressherald.com/life/audience/that-70s-show_2010-04-04.html. Retrieved October 10, 2010. "“Seeing Portland” focuses on the work of photographers from the 1970s and early ’80s, including “Splendid Restaurant, Congress Street, Portland, 8/20/76” by Todd Webb. The show opens Saturday at Zero Station in Portland. ... The exhibition brings together the work of several accomplished photographers. In addition to Graham, photographers with work in the show include Tom Brennan, C.C. Church, Rose Marasco, Joe Muir, Mark Rockwood, Jeff Stevensen, Jay York and Todd Webb." ^ Graham, Gillian (December 2, 2013). "Civic center to become home to new lacrosse team". Kennebec Journal. http://www.kjonline.com/news/Civic_center_to_become_home_to_new_lacrosse_team_.html. Retrieved December 2, 2013. ^ Huang, Josie (April 23, 2007). "Portland diners keep fast-food urges under control". Portland Press Herald (Blethen Maine Newspapers, Inc.). http://pressherald.mainetoday.com/news/local/070423fastfood.html. Retrieved April 23, 2007. ^ Goad, Meredith (September 18, 2009). "A second course of food glory". Portland Press Herald. http://pressherald.mainetoday.com/story.php?id=284061&ac=PHnws. Retrieved September 25, 2009. ^ Knowlton, Andrew. "Portland, Maine: In the Magazine: Bon Appétit". Bonappetit.com. http://www.bonappetit.com/magazine/2009/10/americas_foodiest_small_town_2009_portland_maine. Retrieved April 28, 2013. ^ Goad, Meredith (April 16, 2007). "Portland has taste of food fame, but the other Portland is served". Portland Press Herald (Blethen Maine Newspapers, Inc.). http://pressherald.mainetoday.com/news/local/070416delicious.html. Retrieved April 16, 2007. ^ Goad, Meredith (April 5, 2007). "Food could put Portland on the map". Portland Press Herald (Blethen Maine Newspapers, Inc.). http://pressherald.mainetoday.com/news/local/070405food.html. Retrieved April 5, 2007. ^ Goad, Meredith (April 11, 2007). "Where chefs come to shine". Portland Press Herald (Blethen Maine Newspapers, Inc.). http://pressherald.mainetoday.com/foodhealth/soup2nuts/070411soupnuts.html. Retrieved April 11, 2007. ^ First, Devra (February 13, 2008). "James Beard Awards: and the nominees might be". The Boston Globe. http://www.boston.com/lifestyle/food/dishing/2008/02/james_beard_awa.html. ^ "History Hoagie Sandwich, History Submarine Sandwich, History Po' Boys Sandwich, Poor Boy Sandwich, History Dagwood Sandwich, History Italian Sandwich". Whatscookingamerica.net. http://www.whatscookingamerica.net/History/HoagieSubmarinePoBoy.htm. Retrieved April 28, 2013. ^ Kamila, Avery Yale (August 19, 2009). "Veteran plant-eater happily endorses veggie chic". Portland Press Herald (MaineToday Media, Inc.). http://www.pressherald.com/archive/veteran-plant-eater-happily-endorses-veggie-chic_2009-08-18.html. Retrieved August 19, 2009. ^ Koenig, Seth (November 6, 2013). "Portland police chief, Maine attorney general say Portland pot legalization vote won’t change enforcement strategies". Bangor Daily News. http://bangordailynews.com/2013/11/06/politics/portland-police-chief-pot-legalization-doesnt-change-anything-about-enforcement-state-law-prevails/?ref=search. Retrieved June 1, 2014. ^ "REGISTERED & ENROLLED VOTERS - STATEWIDE". November 6, 2013. http://www.maine.gov/sos/cec/elec/2013/r-e-active11-13.pdf. Retrieved May 31, 2014. ^ Richardson, Whit (March 5, 2013). "Nova Scotia rejects both proposals to restart ferry service to Maine — Portland — Bangor Daily News — BDN Maine". Bangordailynews.com. http://bangordailynews.com/2013/03/05/news/portland/nova-scotia-rejects-both-proposals-to-restart-ferry-service-to-maine/. Retrieved April 28, 2013. ^ "America's Foodiest Small Town". http://www.bonappetit.com/magazine/2009/10/americas_foodiest_small_town_2009. ^ "America's Most Livable Cities". Forbes. April 1, 2009. Archived from the original on December 8, 2012. http://archive.is/4Quw. Retrieved April 7, 2009. ^ "Frommer's Top Travel Destinations for 2007". Frommer's (Wiley Publishing, Inc.). November 21, 2006. http://www.frommers.com/destinations/article.cfm?destid=362&articleid=4056&t=Frommer%27s%20Top%20Travel%20Destinations%20for%202007. Retrieved November 29, 2006. ^ Quimby, Beth (September 10, 2010). "Portland joins list of top college cities". Portland Press Herald. http://www.pressherald.com/news/portland-joins-list-of-top-college-cities_2010-09-10.html. Retrieved September 10, 2010. ^ "The Coolest Small Cities in America". GQ. http://www.gq.com/food-travel/travel-features/201011/coolest-small-cities-in-america#slide=7. Retrieved November 6, 2010. ^ "Yep, We’re Gay! Study Finds Portland (Maine!) Third Gayest City". LiveWorkPortland. July 25, 2010. http://www.liveworkportland.org/2010/07/25/yep-were-gay-study-finds-portland-maine-third-gayest-city/. Retrieved January 19, 2011. Michael C. Connolly. Seated by the Sea: The Maritime History of Portland, Maine, and Its Irish Longshoremen (University Press of Florida; 2010) 280 pages; Focuses on the years 1880 to 1923 in a study of how an influx of Irish immigrant workers transformed the city's waterfront. John F. Bauman. Gateway to Vacationland: The Making of Portland Maine(University of Massachusetts Press: 2012) 285 pages; Explores the socio-economic, political and cultural history of Portland emphasizing the evolution of the city's built environment after the fire of 1866. Wikivoyage has a travel guide for Portland, Maine. This page uses content from the English language Wikipedia. The original content was at Portland, Maine. The list of authors can be seen in the page history. As with this Familypedia wiki, the content of Wikipedia is available under the Creative Commons License.